Not to be outdone by the feisty Opportunity Rover, the HiRISE camera on NASA’s Mars Reconnaissance Orbiter (MRO) turned in its homework this evening with a fine image of comet C/2013 Siding Spring taken during closest approach on October 19. The highest-resolution images were acquired by HiRISE at the minimum distance of 85,750 miles (138,000 km). The image has a scale of 453 feet (138-m) per pixel. The top set of photos uses the full dynamic range of the camera to accurately depict brightness and detail in the nuclear region and inner coma. Prior to its arrival near Mars astronomers estimated the nucleus or comet’s core diameter at around 0.6 mile (1 km). Based on these images, where the brightest feature is only 2-3 pixels across, its true size is shy of 1/3 mile or 0.5 km. The bottom photos overexpose the comet’s innards but reveal an extended coma and the beginning of a tail extending to the right. To photograph a fast-moving target from orbit, engineers at Lockheed-Martin in Denver precisely pointed and slewed the spacecraft based on comet position calculations by engineers at JPL. To make sure they knew exactly where the comet was, the team photographed the comet 12 days in advance when it was barely bright enough to register above the detector’s noise level. To their surprise, it was not exactly where orbital calculations had predicted it to be. Using the new positions, MRO succeeded in locking onto the comet during the flyby. Without this “double check” its cameras may have missed seeing Siding Spring altogether! Meanwhile, the Jet Propulsion Lab has released an annotated image showing the stars around the comet in the photo taken by NASA’s Opportunity Rover during closest approach. 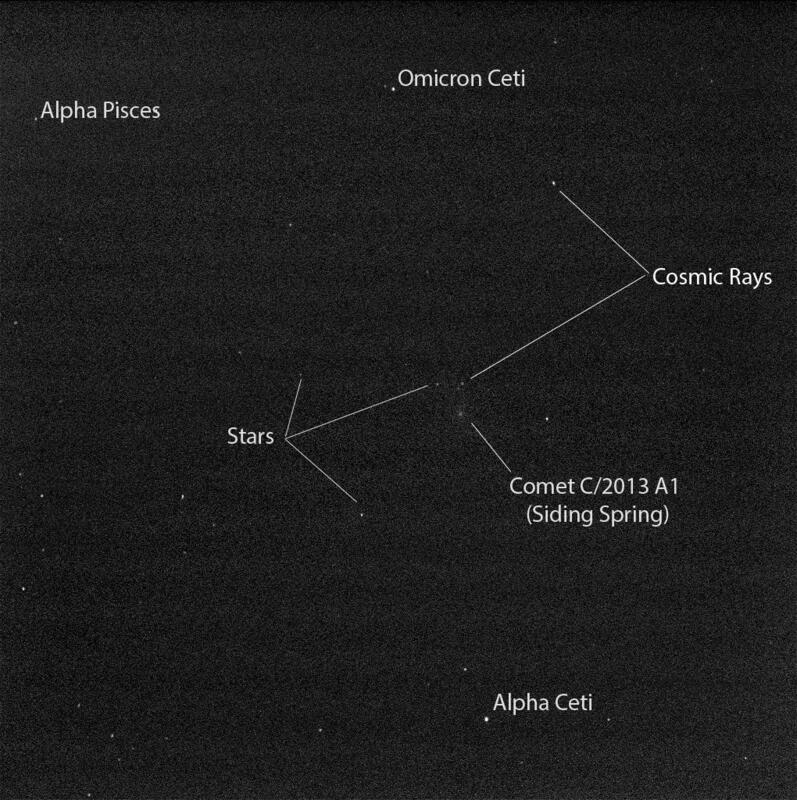 From Mars’ perspective the comet passed near Alpha Ceti in the constellation Cetus, but here on Earth we see it in southern Ophiuchus not far from Sagittarius. After seeing photos from both Earth and Mars I swear I’m that close to picturing this comet in 3D in my mind’s eye. NASA engineers and scientists deserve a huge thanks for their amazing and successful effort to turn rovers and spacecraft, intended for other purposes, into comet observatories in a pinch and then deliver results within 24 hours. Nice work! Great photos of a very little comet with a big impact. The following is proabably a factor in the computer models of comets. The gases and dust expelled by the comet reflect sunlight before it can reach the comet’s surface – cause more heating and so reduces the production of gas and dust. Its a feedback loop. I would think that for a smaller comet, the impact of the feedback is greater than a large comet. Also, the types of gases and the ratio of volatiles to non-volatiles in the comet would determine the albedo (reflectivity) of the coma surrounding the comet. So maybe this small comet’s output has effectively put a stopper to an increase in the amount of gas/dust production. I would think that one could make model light curves for comets versus their size and the ratio of volatiles to non-volatiles in its makeup. And just the fact that the comet is so small, limits the amount of gas production. I was telling my brother that considering how long it took to reach perihelion – millions of years, missing his birthday by half a day is really nothing. This is his birthday comet. It will not be long before a robotic craft could be sent out toe intercept a small comet like this and re-direct its trajectory into, for example, the polar cap of Mars. The impact would be equivalent to the energy of 100 to 200 thousand 1 megaton nuclear explosions and would vaporize a lot of water and CO2 and quickly alter the Martian atmosphere and surface. This might be a way to kickstart terraforming. Any Martian colonists would either have to hunker down underground or just leave the planet for a year or two. Yes, Tim, definitely in time for his birthday in the grand scheme of things! Its truly remarkable that such a small comet could be discovered at a 1 billion km distance. Before digital photography I don’t think a photographic plate could have done what the Siding Spring telescope and digital detector did. One, sky fogging on a long exposure would washed out diffuse objects as dim as it was, and two, the amount of coverage that astronomers doing surveys could accomplish was far less because of the limits of film – exposure times, processing and analysis. What’s your thought on this Bob? I agree Tim, but while I enjoy seeing so many comets discovered so early thanks to surveys and new detectors, I have a warm spot in my heart for the “olden days” when amateurs did most of the comet-finding from backyards and deserted roads. Not than there aren’t tons of ways amateurs can contribute now. More than ever actually, and I sense our work is more appreciated now than decades ago. I must say it is nice to have comments back. Its just as fun to comment as to write a story. If you recall, MRO HiRISE was able to slew the vehicle and capture the Mars Phoenix falling through the atmosphere on its parachute. Their control of attitude is really excellent. As long as they knew where to point, catching the comet was like child’s play compared to a spacecraft just a few miles away. Its a great spacecraft and system. In contrast, MGS’s camera was single array push-broom variety that required the forward motion of the spacecraft to capture scan line after scan line to build images. That older camera could not have accomplished the imaging MRO’s did. Hi Tim, HiRISE is also a push-broom camera system that uses the forward motion of MRO to build up images line by line. It’s got a fancier set of CCDs and electronics, but the fundamental way in which we take images is the same as MGS’s MOC camera. Tim – yes, I remember that image. Wonderful! After “C/2013 A1 Siding Spring”, to be honest, I feel dissatisfaction…! Remember the last comet of the century? Comet ISON. Had that been the comet skimming by Mars, it would have been quite spectacular. Great for a Mars flyby but ISON was not the comet of the century. NASA and ESA stated that the risk was low but there was a “just in case” situation so there were the live feeds and bloggers doing Google hangouts. Space exploration is not Hollywood. The Agency and ESA have gotten better at delivering their discovery and there is some theater to it but while they can effectively role out a red carpet, they can’t put an Oscra De La Renta evening gown on a comet. Space and especially comets are a fickle things, like the weather. The moment you let your guard down, it bites you and then you are summoned to Capital Hill to explain why you failed to inform or prepare us. Discovery of life beyond the Earth falls into this scenario. Discussion with some exaggeration is preparing us for a first discovery. It is likely to be nothing more than a few spectral lines in the light from a far off planet but its still not something to just spring on humanity one day; though you would get the full measure of surprise that way!